Alien: Covenant (2017), R, 122 minutes - With Alien: Covenant, director Ridley Scott gives us the second prequel film to the horror franchise he launched nearly forty years ago. Covenant takes place ten years after the events of 2012's Prometheus, a rapidly anticipated film, that didn't quite seem to live up to the public's lofty expectations. 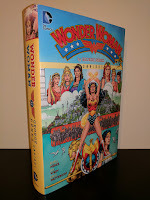 With the Wonder Woman film coming out in a few short weeks, and the second omnibus volume of this run coming out this week, I couldn't think of a better time to share my thoughts on this beautiful collection. I am by no means an expert on Princess Diana of Themyscira but like many others my age, I have been a casual fan of the character since childhood (thank you Lynda Carter). Prior to this volume I had never read much of her seventy five years worth of comic book history aside from the two Greg Rucka runs (early 2000's, DC's current Rebirth era), and the Brian Azzarello run from the New 52 (2011). I had always heard that George Pérez's work from the mid-80's may be the best Wonder Woman run out there, so when this book first crossed my radar late last year (about a year after its release), I felt like I owed it to myself to check it out. Batman & Bill (2017), NR, 93 minutes - When asked the question 'who created Batman? ', the overwhelming majority of people able to answer (including myself) would reply with the following answer: Bob Kane. The thing is, that answer is only half right, but until a couple of years ago there was absolutely no acknowledgement of that in any form ranging from comic books to movies. The other, much lesser known half of the answer is: Bill Finger. This previously little known fact is why this Hulu documentary is so important. Not just to the history of Batman, but to comic books in general. It is quite simply an amazing, unbelievable, sometimes heart-wrenching tale about how a children's author named Mark Tyler Nobleman discovered that the world only knew half of the story, and how he set out to right that wrong. Guardians of the Galaxy Vol. 2 (2017), PG-13, 136 minutes - Writer/Director James Gunn's original Guardians of the Galaxy became a pop culture phenomenon three years ago when he took relatively little known characters from the cosmic corner of Marvel's comic book universe and created a fun, humorous, heartfelt, space opera with a nostalgic soundtrack. The film was so successful that within days of its release, it was announced that Gunn would immediately begin working on a sequel. This weekend that sequel has hit theaters and despite the three year build up of hype, it has proven to be well worth the wait.